While many people pushed to finish their last minute Christmas shopping and the "Dear Leader" leaving this existence flew to the front of the headlines, some may have missed that the last US convoy left Iraq. The official draw down in troops concludes at the end of the year. 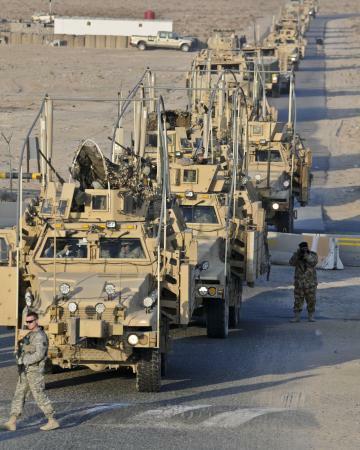 The photo below shows soldiers from the 3rd Brigade Combat Team of 1st Cavalry Division pulling into Kuwait as the last US convoy leaving Iraq marking another milestone to the completion of Operation New Dawn. We are extremely proud of all U.S. Troops that can now proudly call themselves Iraq war veterans and those that gave the ultimate sacrifice serving our great nation in Operation Iraqi Freedom and New Dawn.